This post was originally published on February 9, 2016 and republished on February 16, 2019 with updated content, photos and a video (located in the recipe card). Thanks for watching and sharing! Isn’t it amazing how different foods are synonymous with certain traditions? More often than not, these traditions have religious roots. 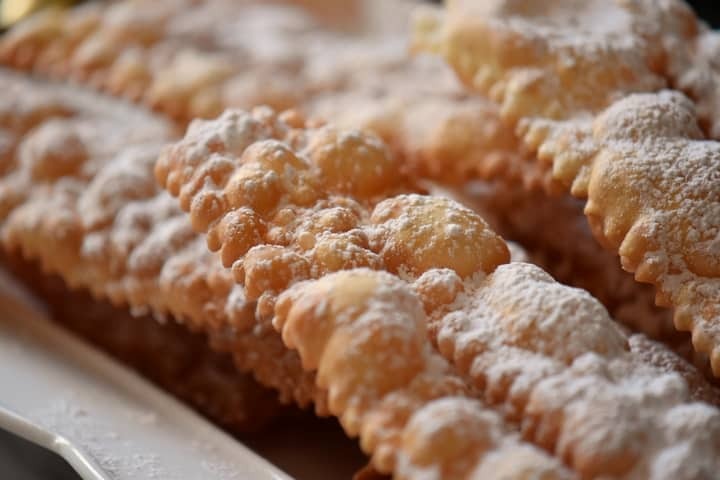 Take, for example, this chiacchiere recipe. Perhaps you already know that Lent is a solemn period in many Christian denominations that covers a period of roughly six weeks before Easter Sunday. Is it a coincidence that these fritters would be made on the eve of Ash Wednesday, the day before Lent began? The day before Lent is the last day of “indulgence” before a forty day fast. Since all “indulgent” foods are forbidden during the Lenten period, it would make sense to have one rich meal on the eve, and this would definitely include the desserts! In Italy, as in North America, mardi gras is the last day of carnival festivities. Lots and lots of celebrations, which usually means lots and lots of food. As you probably know, mardi gras, when translated into English, means Fat Tuesday. This day is also referred to as Pancake Tuesday. Yet another reason to celebrate! But if you’re like me, you don’t need an excuse to have pancakes. Just in case you need some pancake inspiration, how about this recipe for some Ricotta Pancakes? Also interesting to note is that Italian cookie names are all different, based on the particular regions of Italy they are from. So whether you are talking about Crostoli (from the region of Emilglia); Sfrappe (from the region Marche); Frappe (from the region of Rome); Cenci (from the region of Tuscany) or Chiacchiere (from the region of Campania), to name but a few, you are referring to a sweet dough which has been rolled out, cut-up (left as flat strips, formed into angel wings or tied into a knot) and then fried. Yes, this is one of the exceptions to my no-fry rule… but when you taste them, you will understand. These fried cookies are then showered with icing sugar. At Christmas, a variation of these fritters would be drenched with honey (the dough is less crispy). 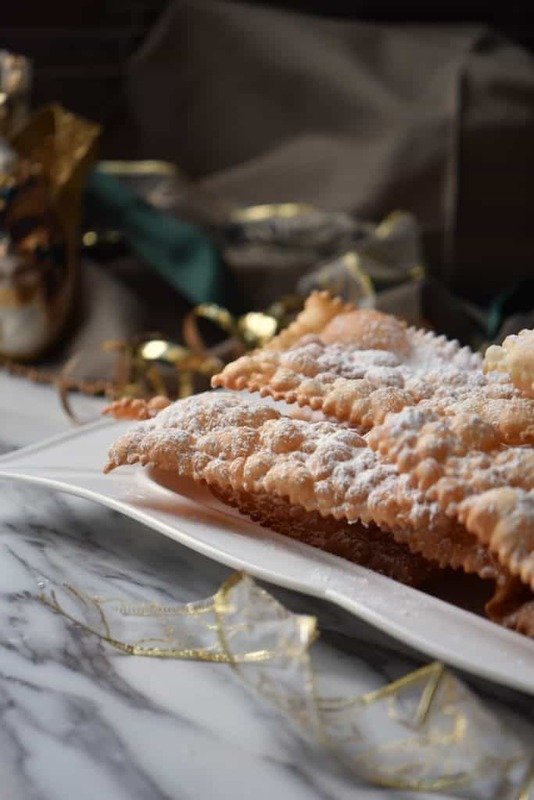 As in most Italian dishes, this recipe for chiacchiere is not difficult to make, but it does require a little bit of time. Don’t let that discourage you. If you can, enlist the help of your partner, daughter, or best friend! It really does make the whole process more enjoyable, not to mention easier. I’ve think I’ve done enough chattering… more on that later. For now, let me show you how easy these are to make! 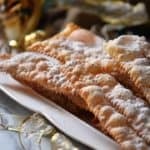 What do I need to make this Crostoli recipe? Sugar. Just a few tablespoons. Baking Powder. Just a few pinches. Eggs. Extra large; room temperature is best. Oil. A few tablespoons for the dough, a little more to fry with. Liquor or wine. Use whatever you have on had… grappa, brandy, rum, marsala or even white wine. Lemon Zest. Can be replaced by orange zest. Icing Sugar. Just a little sprinkling will make all the difference. As far as accessories are concerned, you will need a stand mixture (or a handheld mixer), a wooden board, a rolling pin or pasta roller, a knife and a fluted pastry wheel. You will also need a heavy bottomed pot, a couple of forks, a slotted spoon (or a spider), and a large baking sheet lined with paper towels. Sometimes, I knead this Italian fried dough the old fashioned way by making a well and working the dough; other times I will use my stand mixer. Feel free to use whatever method is easier for you. Either way, this dough comes together in no time at all. Today, I am making these wonderful fritters with my stand mixer. 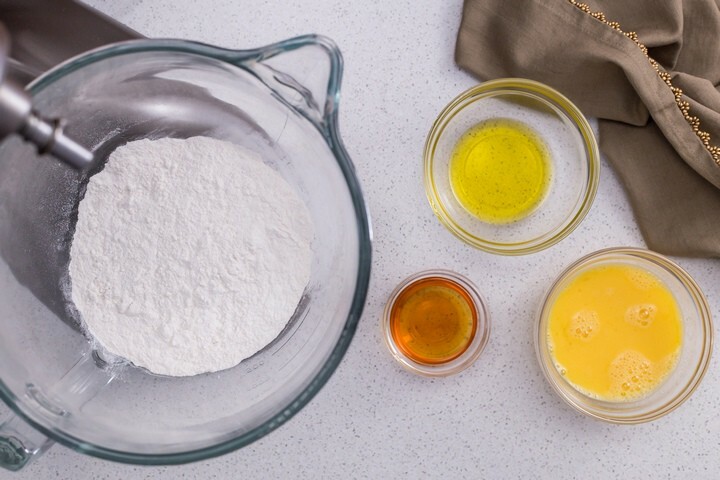 In the bowl of a stand mixer, combine the dry ingredients. On low speed, incorporate the whisked eggs. Add the oil, followed by your liquor of choice and the lemon zest. Word of caution: the dough might appear to be a bit on the “dry”side, but don’t be tempted to add liquid. Once it rests, it becomes the softest dough to work with. So as mentioned, the dough needs to rest. Wrap it up with some cellophane and put it aside, at room temperature, for at least thirty minutes; ideally one hour. Then it’s just matter of passing the dough through the pasta roller. I find it very hard to manage a piece of dough that is 6 feet long! So I like to work in smaller batches. As always, feel free to adapt this crostoli recipe to your own method. Cut the dough in half. Be sure the wrap up the dough that you are not using with cellophane as this dough dries up very quickly. Since it is easier to work in small batches, cut each dough section into thirds or quarters. 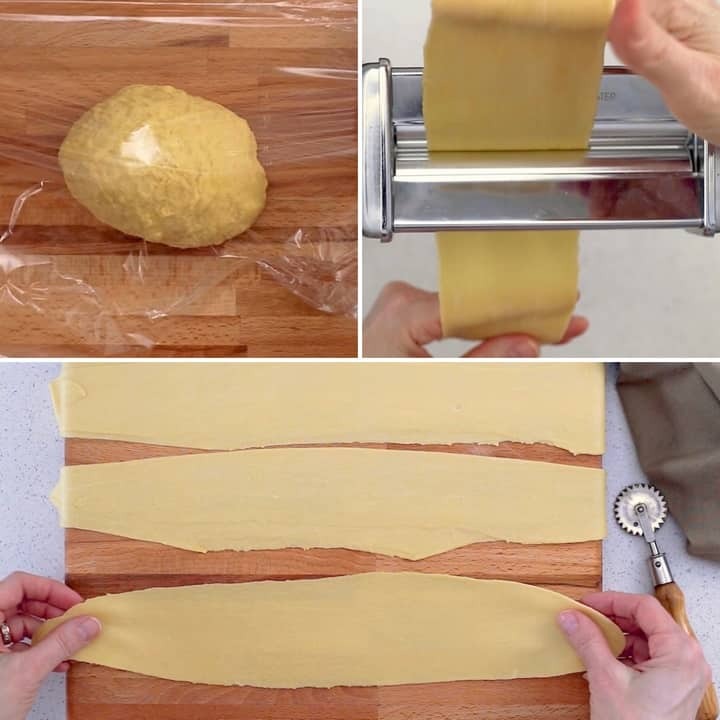 Then, flatten each piece of dough with your fingers in order for it to pass through the widest setting of your pasta roller. Begin to thread the dough through the rollers. Fold the sheet of dough over itself and pass it through again. Repeat this process, at the widest setting, 6-8 times in order to remove the air pockets in the dough. This action also continues to “knead” the dough making it smoother. Don’t be surprised when you hear bubbles of air burst! We are now ready to start the process of stretching and thinning out the dough. Continue to reduce the width of the rollers as you pass the dough through each setting, only once, up until you reach the last or second to last setting. Set the piece of flattened dough on a wooden board and cover with a clean tea towel. Continue in this fashion until all the dough has gone through this process. I usually make these with my daughter and husband. The extra help means we are very quick. One person will pass the dough through the rollers, one will cut and one will fry. If you are alone making these, be mindful that the dough will quickly dry our so work quickly through the steps. Cut the thin sheets of dough into little strips with a fluted pastry wheel. This is a rustic kind of treat, so as long as they resemble a rectangle, there is no need to pull out a ruler to start measuring. This is carnival food after all! 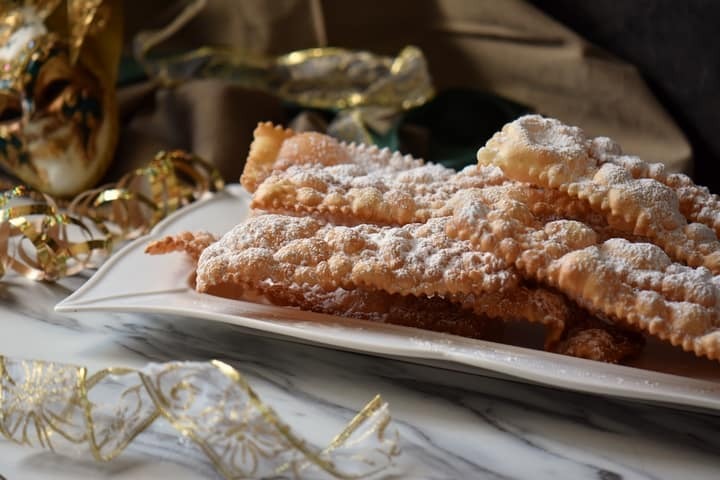 Would you believe this fried Italian cookie is sometimes referred to as Italian ribbon cookies? Yet another name to add to the long list of names. What is important however is to cut a slit down the middle of your rectangle. This will encourage the dough to puff up nicely. The exception is if you are making the shape of angel wings. Basically, just pinch the middle of the dough and make small slits on the bow. Before we begin, line a few baking sheets with paper towels. This will help to absorb the excess oil from the crostoli once removed from the pot. Fill a heavy bottomed pot with a couple of inches of vegetable oil. Heat the oil over medium-high heat to a temperature of 375°F. Always exercise extreme caution when frying. Gently drop 2-3 pieces of crostoli dough in the hot oil. Notice how the dough immediately puffs up. With the help of a two forks, quickly turn them over for a few more seconds and remove with a slotted spoon as soon as they turn golden brown. The whole process for each batch takes 5-6 seconds. Do not overcrowd the pot. Transfer to baking sheets and allow to cool. Repeat this process until all the crostoli have been fried. Dust these crispy, flaky Italian sweets with icing sugar just before serving. Well, you can probably guess that I grew up with these Crostoli. My mom would refer to them as Chiacchiere, which is pronounced key-AH-kyer-ay. This funny sounding word, when translated refers to chatter or chit chatting. She would always include them as part of the many Italian Christmas cookies that were made during this period. These would also make an appearance at Easter. Needless to say, they were always a big hit. As I was frying these “bow tie cookies”, I was transported back to my childhood. That’s the magical ability of food… you never know what memories can be unlocked, just by a smell. I remember the frenzy of activity that was my mom and grandmother preparing traditional foods for family and friends. Everyone looked forward to having these carnival fritters. The original recipe would call for 1 dozen eggs! I remember my grandmother and my mom spending hours in the kitchen… rolling out the dough (with a rolling pin!) until it was paper thin. It’s so much easier today with the help of my pasta roller. I have scaled down the recipe… but I remember the effort and the amount of work involved. And yet, not once did I hear any complains. It really was a labor of love. Hope this recipe for these crispy Crostoli, will contribute to your carnival celebrations! 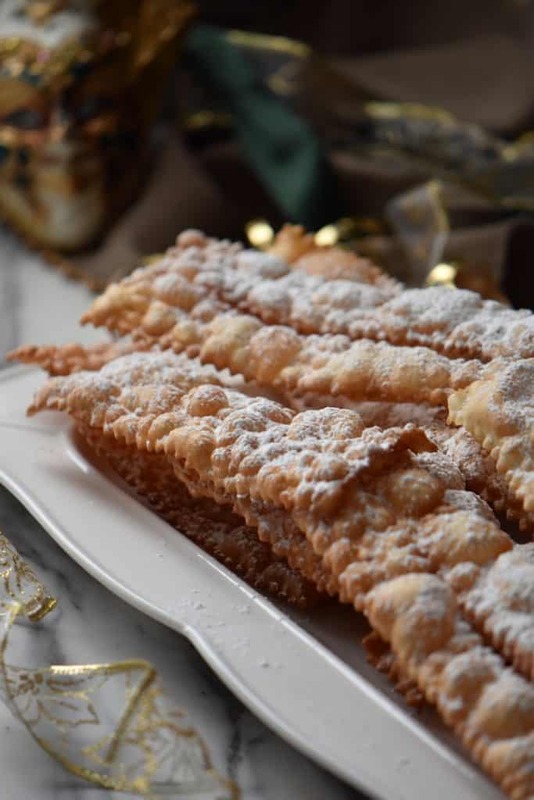 ★★★★★ If you have made this Crostoli recipe, I would love to hear about it in the comments below and be sure to rate the recipe! It’s carnival time! 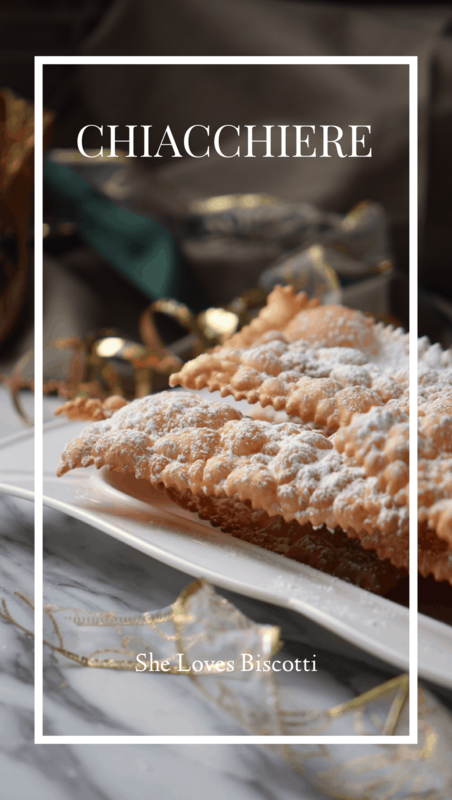 In keeping with my family’s tradition, I love to make this family recipe for authentic Crostoli aka Chiacchiere Napoletane. In the bowl of a stand mixer, combine the dry ingredients. Add the lightly beaten eggs and use the dough hook to combine. The mixture will resemble small breadcrumbs. Add the oil, liquor and lemon zest. Mix together for a few minutes. Remove dough hook and knead gently a few times. Alternatively, can knead by hand. Once the dough is formed, shape into a ball, cover with a piece of plastic wrap and let it rest for about 1 hour. Prepare a large tray lined with paper towels. Divide the dough into 2 parts. Work with one half of the dough at a time while keeping the rest covered with plastic wrap. Cut each section into 3-4 pieces and flatten each piece in order to start the process of thinning out the dough. 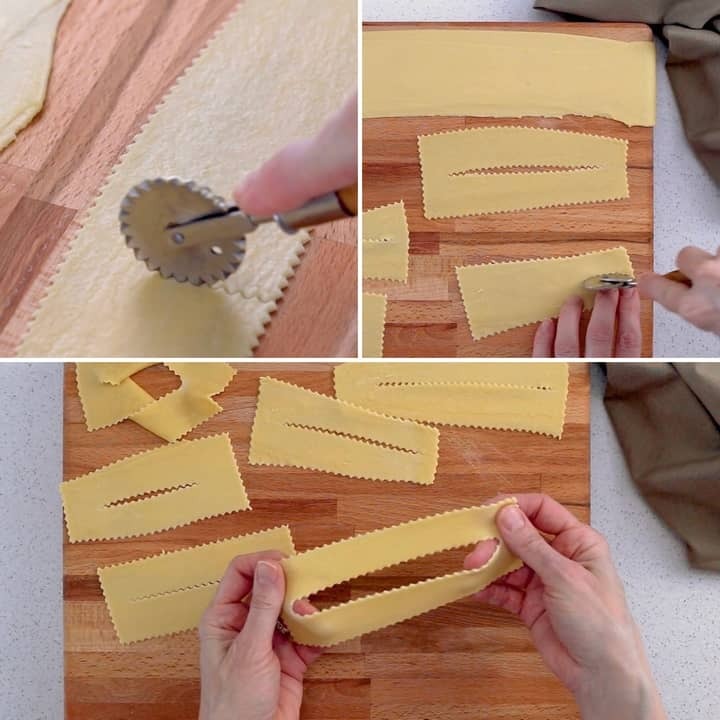 Start at the widest setting of your pasta roller and begin to thread the dough through the rollers. Fold the piece of dough and pass it through again. Repeat this process 6-8 times (at the widest setting) in order to remove the air pockets of the dough. Begin to reduce the thickness until you reach the last or second to last setting of your pasta roller. Place the piece of dough on a flat surface or wooden board and cover with a piece of cellophane. Continue in this manner until all the dough has gone through this process. With a fluted pastry wheel, cut into rectangles (or whatever size you want); make a slit (or two) down the middle. Gently drop each piece of dough in the hot oil. The dough should immediately puff up. Quickly turn them over for a few more seconds and remove with a slotted spoon. Place on a large tray which has been lined with paper towels. This process for each piece of dough should take 5-6 seconds. Repeat until all the dough has been rolled, cut and fried. 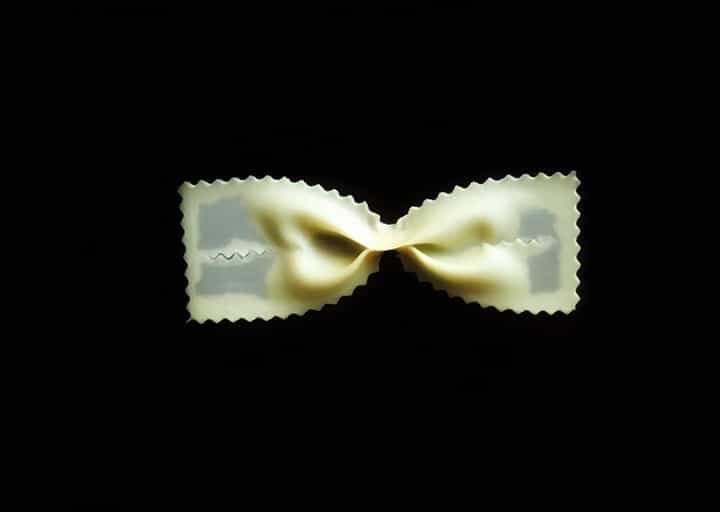 it’s so nice to hear the ‘history’ behind the ‘bowties’ as my family called them. I learned how to make these late in life from my aunt who is now in hospice. She fastidiously made sure I did all the steps correctly. We made them at Christimas time once a few years back. I’ve forgotten about them and once hesitant to make them again with her by my side because it would be only the second time I’ve done it. So to find your recipe which was her recipe was such a gift. My daughter moved recently to Texas and when I go visit with her we will do these around Easter together as a family and bring back happy memories. I know they’ll come out delicious. Thank you again and keep blogging. Thank you so much for your kind words Paula. I’m happy this recipe brings back some wonderful memories… that’s the power of food! Enjoy the time with your daughter ♥ Wishing you all a Happy Easter! These are so addictive. It’s dangerous for me to be around a tray of these, and yours look especially wonderful. Thanks so much Linda! I agree, absolutely addictive! Mamma Rosa uses whisky or millefiori in hers (I have a recipe on my blog also) – the crunch is not the same without the alcohol! Great comment! Yes, I agree, the liquor is a must. Thanks so much for stopping by. Thank you so much for the recipe and wonderful background information! I have a family recipe that I use very similar to yours. My recipe has 6 eggs and no olive oil or butter. Would my recipe benefit from the addition of the oil or butter? Do you know how it would change the crostoli? Thank you so much for any thoughts you can share!! Merry Christmas!! Thanks so much for your advice! I am going to modify my recipe and add either oil or butter and see the difference. Can’t wait to try it! That´s just really beautiful!! In Portugal, in the region of Alentejo, we make a Christmas treat that’s EXACTLY like your carnival fritters!! 🙂 We called them Filhós. And although we have various kinds of “filhós” throughout Portugal, the ones we make in Alentejo are exactly like your chiacchiere!! Sounds like a wonderful recipe and I can’t wait to try it. We do not use alcohol of any kind. What do I substitute for the rum? As always, your product is absolutely beautiful. I love the thinness of the dough and the way it puffs. I struggle with getting this same effect in gluten free doughs, but I’m not giving up. I think I’ve tweaked the gluten free cannoli dough recipe about 20 times now and it keeps getting better, but not quite there yet. And, what a very pleasant surprise to see your reference to my site. I so appreciate that. I completely identify with the reference to food and its association with life memories. That’s what makes it so special. Thanks. Thank you for sharing all the wonderful recipes!